One of the things that intrigued Roberta, was that not only could flies land and walk on the ceiling, they could crap upside down as well. 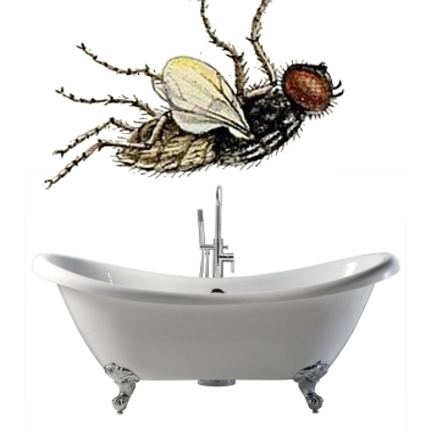 Flies would leave trails of fly poo all over the ceiling and on the ceiling fan. If humans could do that, Roberta thought, think of the space saving in the bathroom. The toilet could hang directly over the bath; although it could be a bit disconcerting if someone was taking a crap while one was bathing naked below. Yes, it was a lazy day for Roberta. She was lying on the sofa with a Danielle Steel paperback, which was why she was looking at the ceiling and thinking silly thoughts about fly dirt. She dozed. She read. She dozed. Why not go the whole hog and put the entire bathroom upside down above the kitchen sink? Flies did it there. Why not us? That would certainly save space. Or on the lounge ceiling. That way, visitors wouldn’t miss out on the conversation when they had to make a quick dash to the bathroom. She muttered this to her husband who was dozing in a nearby armchair. She nodded off again. She quietly died. It was a strange thought to have died with. Roberta had always imagined she’d die after saying something profound.